– Go to ‘Extensions’ – ‘Module Manager’ – switch from ‘site’ to ‘administrator’ in the filter dropdown list and publish Multilanguage Status. Then click on Multilanguage Status in the upper right menu line. If everything is green, it’s OK, you can unpublish the ‘Multilingual Status’ module again. If anything is red, solve that problem first. – Choose primary language as the default frontend (site) language in Joomla. – Test your Jomla multilanguage configuration (you can write an article and add one menu and translate those into all your languages). Note: The standard VirtueMart installation is supplied with the English language files only. So after installing VirtueMart, you have to download and install all other languages seperately. You can download all VirtueMart language packs here: http://virtuemart.net/community/translations. VIRTUEMART 2 CORE, ALL MODULES, ALL PLUGINS EXCEPT PAYMENT. VIRTUEMART 2 PAYMENT PLUGIN LANGUAGE PACKS. The filename is i.e. nl-NL.VirtueMart_Plugins_Languge_Pack.zip. Install all files with the Joomla installer. If you want to use such an incomplete translation, you can go to VirtueMart Configuration > Shop tab and enable Use english as fallback for untranslated strings. 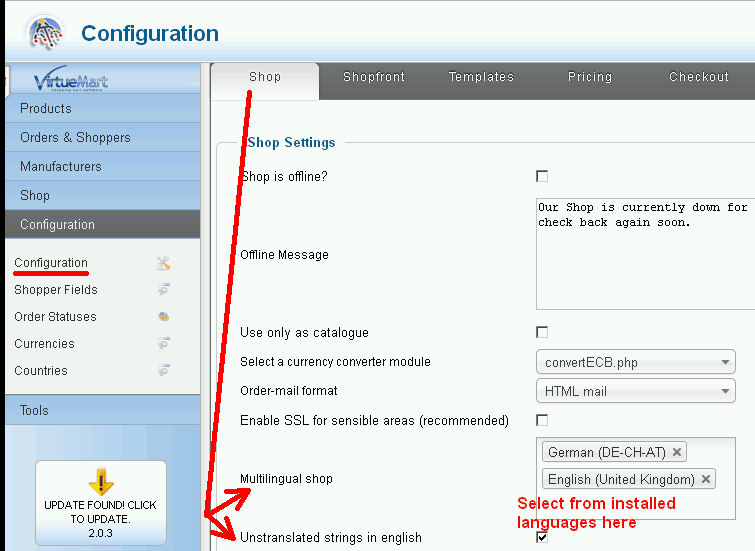 Next, select your languages in VM2 Configuration – First tab – ‘Multilingual shop’ form field. Now you can switch between languages in VM2 as described in the next two points. The VM2 categories can be translated by selecting one of your other languages in the VM2 ‘Product Category Form’ language dropdown list on top of the view. Product descriptions in VM2 can be translated by selecting a different language from the dropdown list in the ‘Product Edit’ view. In Joomla create a menu for each of your languages, holding menu items for all your VM2 categories and the cart.